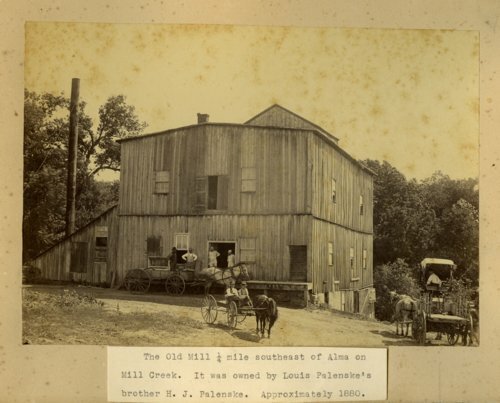 This is a photograph of Pauly Brothers Mill located on the west branch of Mill Creek, one mile south of Alma. The mill was constructed in 1858 by Alma founder Gottlieb Zwanziger, who sold the mill to Pauly in 1875. Pauly, a successful bread-maker in Topeka for several years, made the mill a success by expanding its size and production capabilities. Louis Palenske acquired the mill in 1902, and converted it to steam power before the mill's closing in 1913.